'Dormitorium: An Exhibition of Sets of Films by the Quay Brothers' is currently running at Liverpool's Victoria Gallery and Museum, from 25. March to 28. May 2011 (free admission). 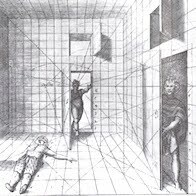 In 1991, the Brothers Quay explored perspective drawing and the issues associated with perspectival distortion in a short film entitled 'Anamorphosis, or De Artificiali Perspectiva'. This beautifully filmed animation offers a excellent introduction to the secrets of anamorphosis. The film was made in collaboration with art historians, Sir Ernst Gombrich and Roger Cardinal. "Anamorphosis is a minor chapter in the vast and complex history of how painters have constructed images of the world. The film seeks to illuminate an artistic technique which plays mischievously yet revealingly with the relationship between the eye and what it sees."